A user story has a simple structure based on the standard agile format of “as a [role], I want to [action], so that I can [outcome]". You can also capture and collaboratively develop the acceptance criteria for the user story during the analysis and development lifecycle. User stories are the result of a clear understanding of requirements, business processes and underlying systems. They are what the development team will use to agree and develop any further resulting technical specifications necessary to configure or develop the app. 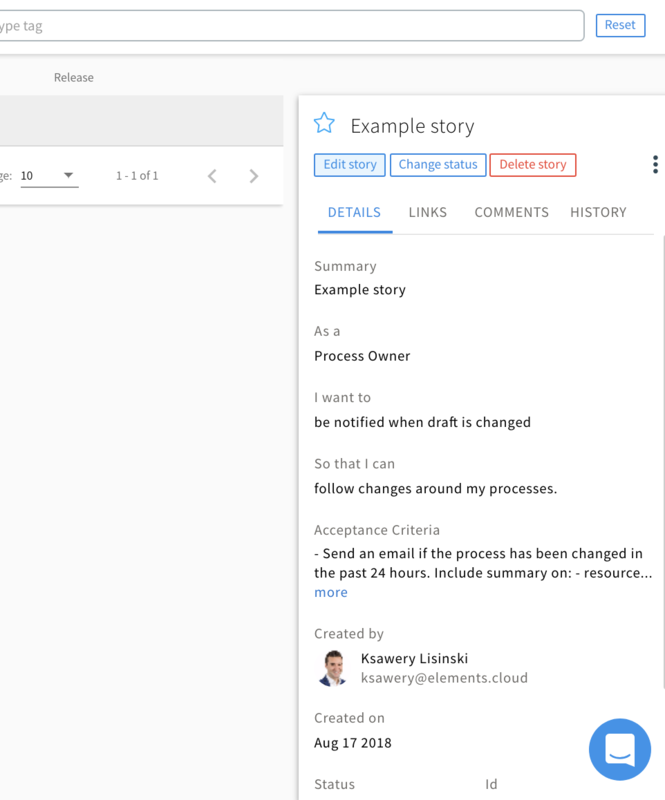 You can add attachments and collaborate on user stories, and the history of status changes is tracked. User stories should ideally be created from a requirement but you can also have stand-alone stories in Elements. 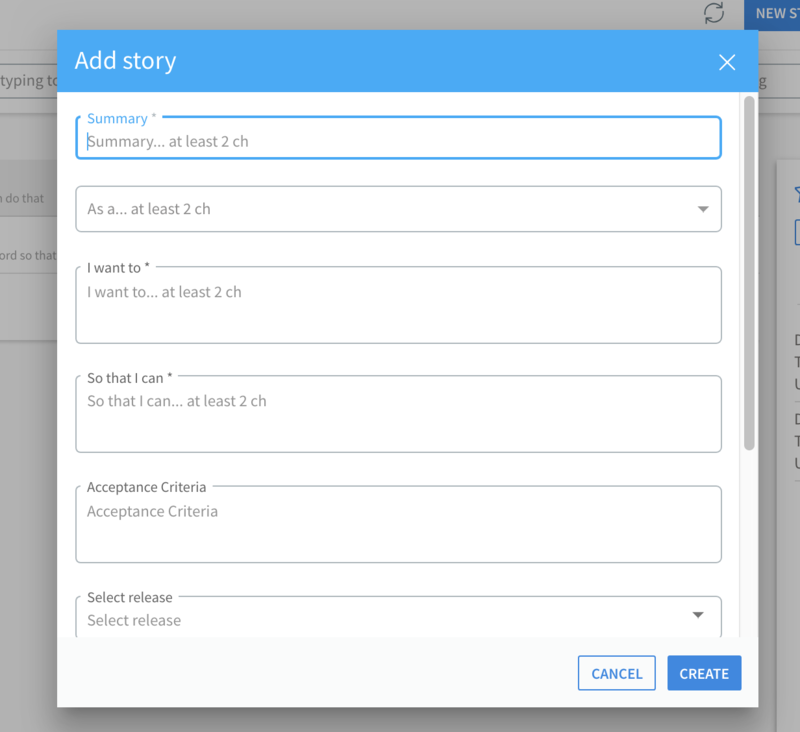 User stories are also the lynchpin of the Jira integration with Elements. Stories, ideally, should be added in the context of a "requirement". You can add one or many in the right panel of a requirement in the STORIES tab. Or you can switch to the stories list and add them there. You will be able to choose the parent requirement for a story if you want one (not mandatory - but you can add the relationship at any time. 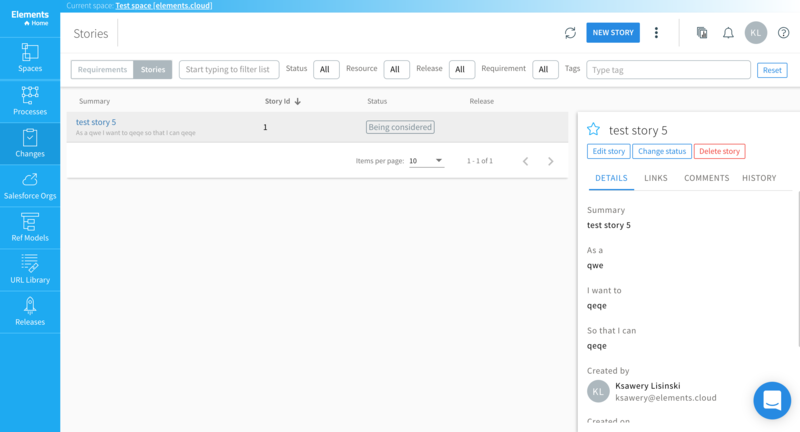 Edit the story, select Requirement in the pick-list in the last field in the User Story). When you add a story you enter a "summary". Next, follow the standard agile structure of “as a [role], I want to [action], so that I can [outcome]". 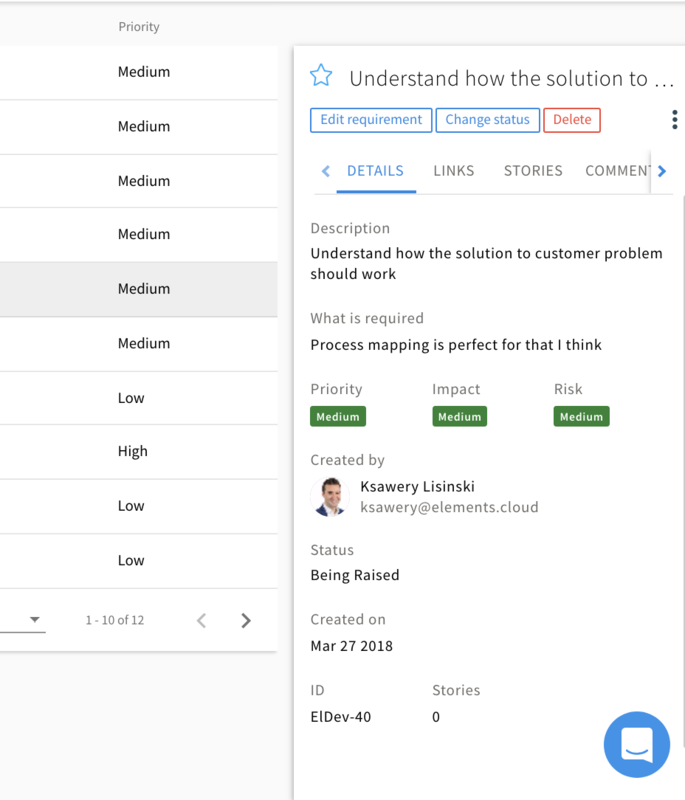 You can also capture and collaboratively develop the Acceptance criteria for the User Story during the analysis and development lifecycle. The “as a” is a drop down list of the resources in the Space. There is a Resource Library which can be created and maintained in the Space management app. You can add tags from existing tags or add new ones to filter stories on. Releases are only available if the Space is Pro and you are using Release and Version Management. 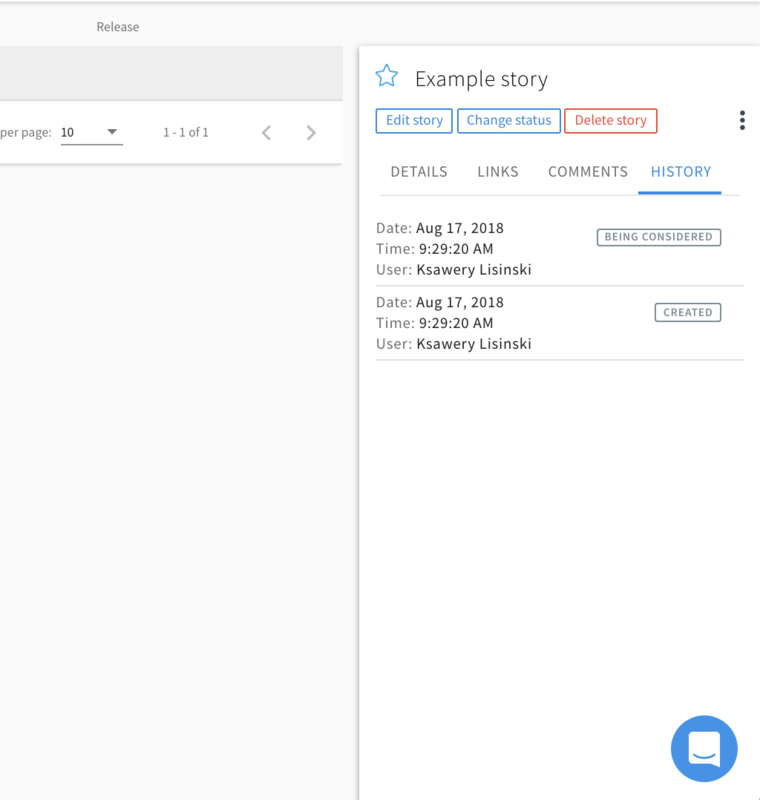 In the right panel you can: edit or change the status of the selected user story; add attachments (Notes, URL Data Tables, Images PRO); collaborate using comments; change the parent requirement of the story, and see the history of the status changes. 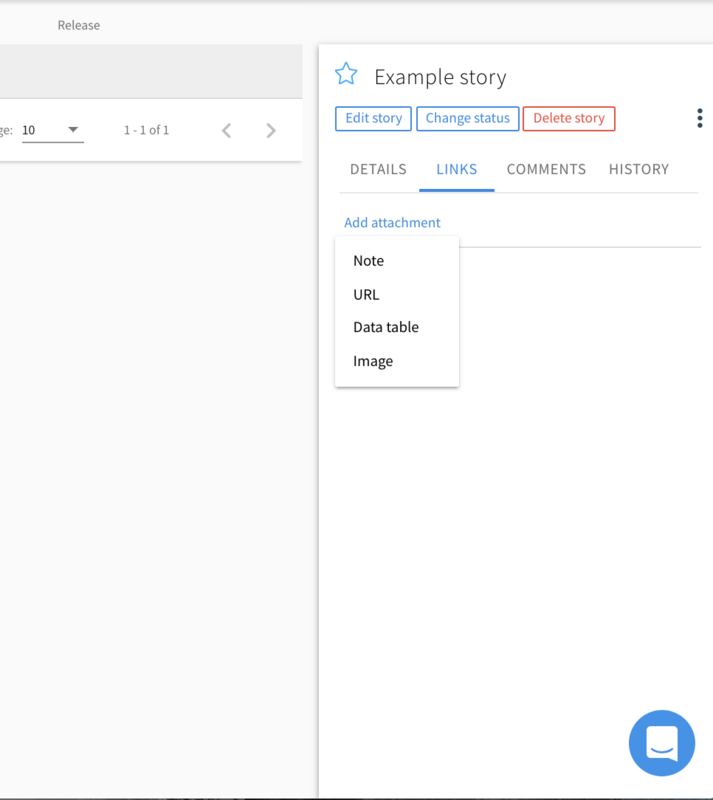 However, you cannot edit stories in any way when they are in a closed status (will not be implemented or released), or when the parent requirement is in a closed status (will not be implemented, duplicate, implemented). If you wish to edit a closed story, you must either reopen the story or the parent requirement. Below are images of the right panel. You can edit, change status or delete using the buttons. You navigate between tabs by using the < and > arrows or by clicking on the tab name i.e. ATTACHMENTS.